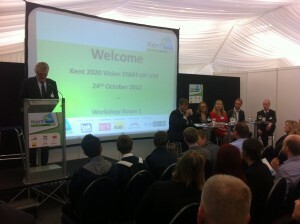 The first ever Kent 2020 Vision Start-Up Live was held last Wednesday 24th October at the Kent Event Centre in Detling. The centre played host to over 60 suppliers and support organisations relevant to people who have either recently started a business or are in the planning stages.There was a phenomenal response to the event and it was estimated by the event organisers that about 700 people came through the doors and that feedback so far has been very positive. Sleeping Giant’s Managing Director and founder Luke Quilter was asked to sit on a panel of local entrepreneurs for a question and answer session. Before attending the event Luke had said that he didn’t know what to expect from the panel session but he was very pleased to be asked. The session was a resounding success. It was standing room only and Luke remarked that “it was really encouraging to see so many young people in Kent interested in setting up a business”. The conference organisers commented that it was “fantastic to see so many people wanting to be in the room”. There’s a healthy amount of entrepreneurial spirit in Kent and delegate comments have confirmed that the event was well received and needed. 3. The unwavering commitment to see it through! This year’s event was such a success that next year’s event is already being planned for 23rd October 2013. To keep up to date with all the goings on of Kent 2020 Vision Live why not follow them on Twitter?